It’s that time of year again. The warmer weather sends everyone running outside. Unfortunately, sunny days bring out bees looking to build nests in and around your home. While great for pollinating plants and producing honey, bees never rank high on anyone’s list of popular houseguests. Whether in a nearby tree, a hole in the ground, in your attic or underneath siding, a bee’s nest located on your property usually causes issues. Protecting your home and your family from these unwanted insects remains your number one priority. Bees can enter your home or any building that has a hole of about a quarter of an inch or larger. Making sure you seal any and all holes reduces the risk of them finding their way in to nest. The best solution for preventing bees from nesting in or around your home — act fast. Once one has entered your home, more will soon follow. Bees love anything that smells — good or bad. Leaving your outdoor trash can lid on at all times prevents bees from hanging around your home. Bees are even attracted to scents from perfumes and lotions. Limiting the smells you add to your body, especially fruity smells, when spending time outside helps keep them away. Outdoor clutter is one of the largest invitations for bees to enter your home or the surrounding area. Keeping outdoor areas clean is a step in the right direction of keeping bees out and away. Something as little as picking up any unused appliances or equipment laying in the yard helps as well. Bees love the equipment that lays unused because it provides a plentiful shelter and protection for them and their hive. Any structures such as sheds or old unused play structures love providing a home for bees. Bees love these structures, along with tall grasses surrounding them. Keeping these clean prevents the nesting and swarming of unwanted visitors in your home. Since summer is right around the corner, that means barbecues are too. When hosting one, make sure you keep everything covered as best as you can. We all love the smell of a good barbecue, but so do bees, wasps and all of their friends. We all know how annoying bees can be. Aggravating them only makes matters worse. Try your best not to aggravate the bees, for this only makes them mad and more likely to swarm. Just like you would react if someone swatted you, bees get defensive too. 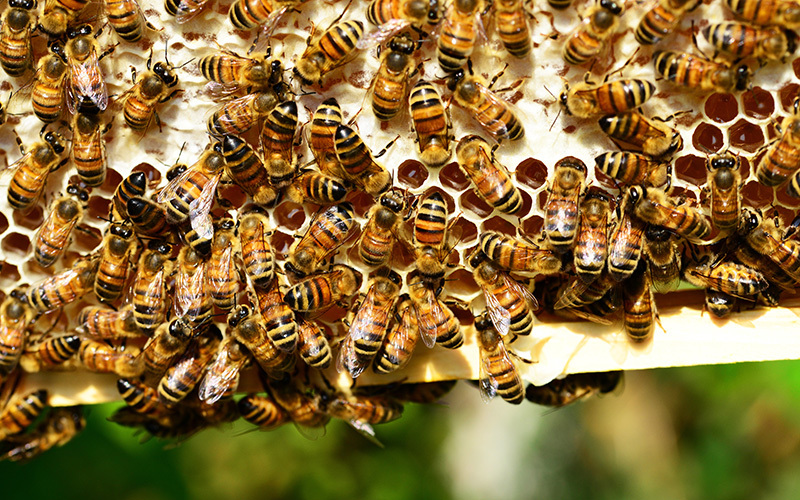 Just like any other pests, bees get annoying in and outside the home. Start enjoying your summer and keep these tips and tricks in mind when beginning your outdoor activities. For more information on protecting your home from bees from the experts at Smitter Pest Control, please contact us here or call us directly at 616.245.7215.